Images from the Twittersphere: DEF CON China [Beta]! Our first DEF CON outside the U.S. is in full swing and day one is on the books! 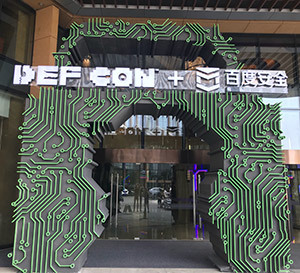 The twittersphere has been providing a window into that first day, so get a load of the photos people have been posting from DEF CON China! Online Registration is open for DEF CON China [Beta]! 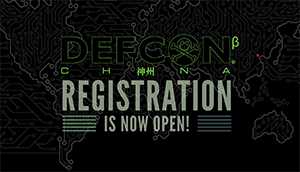 Online registration for DEF CON China [beta] is LIVE! Follow the link, (using the translate feature in Chrome comes in handy) and save yourself a seat at the first international DEF CON hacking conference! Of course, you are not required to make use of the online form. The traditional DEF CON method of cash at the door works too. In fact, if you want to pay at the door, cash is the only option for those visiting China for the conference. The price onsite is ¥1088, which is about USD173 at current exchange rates. Thanks to everyone who’s planning to make the trip and participate in this new DEF CON adventure. We’re working hard to put together a great show and we’ll see you in Beijing in just under a month! 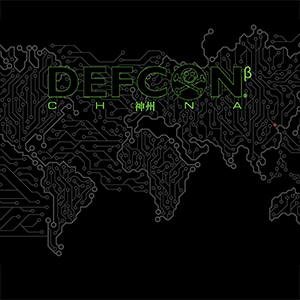 Remainder of DEF CON China Speakers are Live, Schedule Updated! 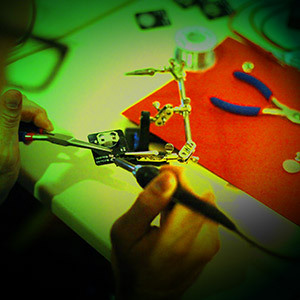 DEF CON China [beta] is almost upon us, and we’re hoping to see lots of you there. To help you make your plans we’ve got a finalized speaker list and schedule! All the presenters are top-shelf and bring a wide variety of technical skill and subject matter expertise - we’re excited about all the final selections. The schedule is now live! Read the abstracts, pick your favorites, and get psyched. Only one month to go until DEF CON China - are you ready? First Round of Talks for DEF CON China [Beta]! More Beijing news for you - we are excited to bring you the first round of accepted speakers for DEF CON China! The first round selections include talks from DEF CON favorites like Zoz, Dan Kaminsky and Jayson Street as well as Chinese researchers like Dr. Tao (Lenx) Wei and Dr. Haixin Duan. Get acquainted with the speakers of Round 1 and watch this space for the announcement of Round 2 selections. It’s coming together, people. We hope you’re as excited as we are . First China Workshops are Live! DEF CON China [beta] is shaping up fast, and we’ve got another exciting content announcement. If you’re interested in a deep dive into these subjects, please visit our workshops page for all the details. You’ll also want to bookmark that page and check back frequently, as we’ll be adding more in the coming days. DEF CON China [Beta] Village Selection has Begun! May 11 approaches, DEF CON enthusiasts, and we have news! Village selection is underway - we can already confirm the following for DEF CON China [beta]. Lockpicking Village, hosted and run by the lock wizards of The Open Organization of Lockpickers (TOOOL). You could not be in more capable hands, whether you’re learning the ropes or testing your skills. Car Hacking Village. Get your hands on the state of the art in connected auto security. RECON Village - For people interested in Open Source Intelligence (OSINT) and its many applications. 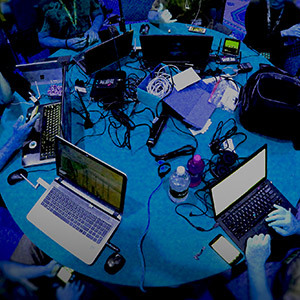 The very popular Packet Hacking Village, where you can hone your knowledge of network hacking in all its flavors. Hardware Hacking Village. Void warranties, break and remake physical tech and smell that sweet solder in the air. You can learn about these villages and keep track as new ones are added for DEF CON China [beta] at the Villages page. DEF CON China is beginning to assume its final form - join us in Beijing May 11-13! DEF CON China [Beta] Site is Live! Calls are open! Contests and Events. Puzzlemasters, game-makers and party-throwers, bring us your best ideas! We want to share the fun side of DEF CON with the world, and if your proposal is selected, we’ll pitch in to make it a reality. Villages. The hands-on mini-con is a perfect introduction to DEF CON, and we’re looking to you to conceive, plan and run the DEF CON Village we’ve never seen but always needed. Assemble your team, create your proposal and join us in Beijing! Demo Labs! This is your chance to show off the project you’ve been hacking on, and get attention and feedback from the DEF CON community. Take that open source effort out of the garage and into the spotlight! You’re still reading - probably because you’re psyched and looking for where you sign up, right? Maybe a DEF CON China website where you can find all the rules, parameters and relevant info? We’ve got that. Head over to https://www.defcon.org/html/defcon-china/dc-cn-index.html, get spun up and then make us proud! DEF CON China [Beta] Call for Papers is Open! The DEF CON China [Beta} Call for Papers is open! 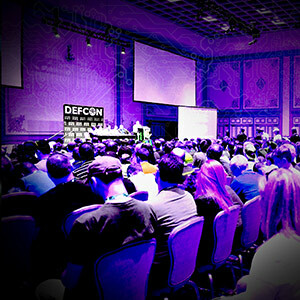 We are seeking presenters with fresh ideas and exciting research to share with the DEF CON community. The event takes place soon – May 11-13, 2018. We are accepting and reviewing proposals on an expedited schedule, and speaking spaces are limited so please respond quickly. We are happy to work with you to perfect your proposal if it arrives in time. The rules for submissions are explained in detail on our CFP page, The Chinese translation of these rules will be online very soon.